Peel and cut approximately 1 cup of pumpkin into 2 cm (1 inch) cubes. Combine marinade ingredients in a container with a lid, mix well. Put cubed pumpkin into the marinade and shake container (with lid on!). If you have time, let the pumpkin sit in the marinade for a couple hours, but it should still work fine if you don't. Place pumpkin on a lightly oiled baking sheet and bake for about 30 min, or until cooked, at 350. Set the marinade aside to use later. While the pumpkin is cooking, thinly slice red onion and wash 3 cups fresh spinach. When the pumpkin is ready, quickly stir fry spinach and ginger together 'til spinach is wilted. 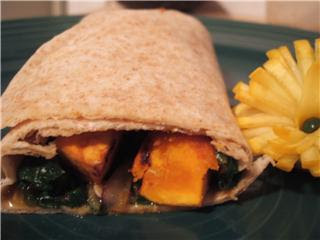 Place a portion of the spinach in a tortilla, sprinkle with sesame seeds, a portion of the baked pumpkin and drizzle some of the marinade over the top. Roll up and enjoy!